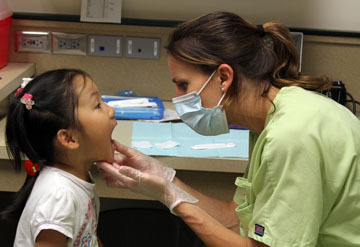 It's a walk-in dental fluoride clinic for children, ages 6 months to 18 years old who are uninsured or are on KanCare. A parent or guardian must be present to sign a consent form for the treatment and to provide the child’s medical card information. There is no charge. Fluoride varnish is 5 percent sodium fluoride resin that is painted on teeth to help make the enamel stronger and more resistant to dental decay. This temporary resin is held in close contact to the tooth surface for four to six hours to allow absorption. It can be brushed off the teeth after a few hours or left on the teeth overnight. Studies show that fluoride varnish is most effective in preventing cavities when applied at least three times a year.